So we are all now at the stage of the season where the game can become a touch boring. Don’t put yourself in this position! So we are all now at the stage of the season where the game can become a touch boring.We’ve completed our squads and if we aren’t in contention, all we can do is wait and hope that some sort of miraculous run occurs allowing us t0 assemble together a reasonable end of year rank. Questions have been asked throughout various forums and sites, asking whether I should trade with ‘x’ number of trades left. Today we will go through the pitfalls and positives of these types of moves, showing that code swapping ‘Karmichael’ style for the next little period may possibly be the best move for your Real DreamTeam sides. At this stage of the year, you truly want the most amount of points on the park week after week, which will show the wider fantasy community just how you managed to pick the best of the best. Holding the likes of Joel Selwood, Nick Riewoldt, Shaun Higgins, Trent Cotchin and so many more has taken its toll, and you feel it’s time to let these loose cannons go. For simple reasons, this type of sideways trade, may just hurt you beyond belief in the long term. Fantasy coaches must come to the realisation that there is still 10 weeks left to go. 10 WEEKS! Lets have a look at what happened last week just so we can confirm how big a deal this is. That picture above is really as graphic an image as you’ll see in any form of AFL Fantasy. Dayne Beams & Steve Johnson, two stalwarts of the fantasy caper missed last week, with the added negator that they were both late outs! No one had the capacity to predict this, and really unless you were exceptionally lucky, no one would’ve fielded a full team because of these issues. Thankfully they aren’t long term injuries and both are likely to take to the park this weekend. So what relevance does this have to the future? Quite clearly, injuries, suspension and Heath Shaw type acts of stupidity will play a part in the second half of the year. With every week that we close in on the end of the season, the likelihood that our players will go down with fatigue induced injuries increases, not to mention the ever high potential for impact injuries. Trades will not be needed, they’ll be fundamentally necessary to field a 22. If we start trading the likes of Joel Selwood (average of 98.42 points per game) to a Michael Barlow (average of 110.75ppg), the best we can hope for is 120 extra points this season (12 point difference multiplied by 10). In Round 20, we may be facing a zero as all of Parker, Martin and Riewoldt are out with injury. In come Stefan Martin and Jeremy McGovern, and with a trade being held you then have the ability to offload Riewoldt to Harvey, potentially making up that 120 difference in one week. This is why I strongly advocate that you look to hold trades, back your premiums and be ready for the oncoming storm. It’s difficult to determine the exact number of trades that must be kept from this stage till the end of the year, because no one is capable of predicting the exact number of outs there’ll be, and some lucky coaches will avoid the bulk of the issues whilst others will come out of the perfect storm with half the ship submerged. Judging through my previous seasons, the number of injuries that require trades doubles from here on out. This season I have owned; Mitchell, Caddy and Ellis who have all required trades due to injury. Doubling that number, I’m predicting I’ll need 6 trades for season defining injuries in the second half of the season. Remember that unlike the first half of the season, were a 2 week injury could be held with the expectation for the player to comeback on return, 2 week injuries in the latter stages of the season can see a player ousted for as many weeks as the club sees fit, depending on their chances of finals footy. How many trades do you expect to use on injuries from here on in? It’s difficult to twiddle your thumbs and sit tight, especially when we are all so use to moving week on week in AFL Fantasy. Trust me though, unless you are vying for real top end prize, you’d best hold and back those under performing premiums. Thankfully with the World Cup on, we can all look to have a saving grace, something to take our mind off the constant urge of getting those stragglers out of your side. Avoiding rash decisions will separate the boys from the men from here till the end of the season! 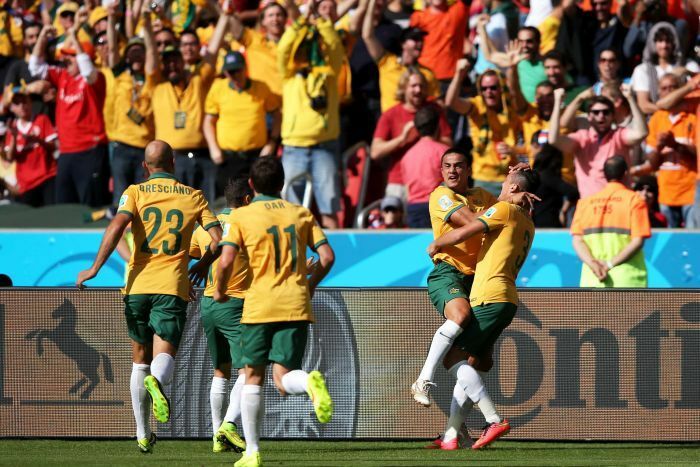 Watching the Socceroos may actually help your DT side! So what do you guys think? Remember to give me a follow on twitter @B_Gogos and tune into AFL Fantasy Radio Live at 7PM this Friday! Ask questions using the #FantasyFM and we’ll answer them in the lead up to the game and then continue with a fantasy commentary during the game! Good luck with all your fantasy sides this weekend! With the willy nilly trading in Fantasy, ive ended up hitting the trade button way too many times in DT. Hoping ill have 3-4 trades up my sleeves for finals but doesnt look likely. I’ve got premiums that I’m frustrated with such as Reiwoldt but rather than sideways trading I’m wanting to use my trades to add more bench depth. What you think about Miles and Steff Martin as bench cover for the rest of the year? I’m ranked 139th with 10 trades left after already having made 2 trades this week. I still have 1 rookie on the field in Langdon though and 2 under performing premiums in selwood and roughy. I have good bench cover on all lines except the backs where I only have litherland for cover so am torn between building up my bank to try and trade litherland to a premium back, so I can keep Langdon as my d7. Or taking the risk and just upgrading Langdon to a premium next week. Have you overlooked some Suns?